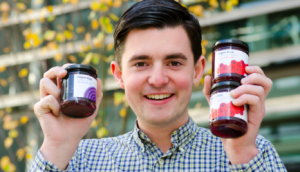 Fraser Doherty, a 24-year-old Scot, is one of the leading jam makers in the United Kingdom (U.K.).He learned the art of jam making from his grandmother in Edinburgh when he was 14. Passionate about making jam, he decided to create his own company, SuperJam, and started selling his products door to door, at farmers’ markets and to delicatessens. Fraser analyzed the jam market in the U.K. and realized that sales were declining, because the existing products were unhealthy and no new brands had appeared for a long time. He was determined to change that. So, he started playing around with his grandmother’s recipes, trying to eliminate adding sugar and to avoid anything artificial, until he ended up developing a method of producing jam 100 percent from fruit and fruit juices. After that, orders picked up fast, with shops contacting him for the jam, so he decided to leave school at the age of 16 and focus full time on developing SuperJam. Seeing his success in local shops, he decided to pitch his products to big supermarkets in the U.K., so he went to a Waitrose ‘meet the buyer day.’ Fraser was told his idea was great, but that he would need first to set up production, create a brand and return with a right price for the jams. Eager to respond to Waitrose’s demands, Fraser started reaching out to factories, as he could not produce the jam needed by a supermarket in his parents’ kitchen. Convincing a factory proved to be a rather difficult task for a teen with no financial resources and no experience. He eventually found a jam factory willing to work with him and mass produce the jams he developed in his kitchen. He also hired an ad agency to create a brand identity for his products. The Waitrose officials were not too enthusiastic with the results. Apart from not liking the flavors, they thought the labels were silly and the factory costs too high. Fraser was determined to convince them. So, he reduced the production costs, by signing on with a new factory and had his ad agency re-envision his brand. In order to cover his expenses and gain more factory time to produce three flavors, Blueberry & Blackcurrant, Rhubarb & Ginger and Cranberry & Raspberry, Fraser used his saving and got a loan for £5,000. He went back to Waitrose and, in March 2007, he became the youngest ever supplier to a key supermarket chain in the U.K., when Waitrose decided to launch his product range in their stores. In the first day, one of the Waitrose in Edinburgh sold 1,500 jars, more jam than they would normally sell in a month. The media coverage surrounding the Waitrose event was incredible. Among other media commitments, Fraser was a guest on BBC Breakfast. More supermarkets, including Tesco, started calling to get the SuperJam. The company currently supplies over 2,000 supermarkets around the world, including Tesco, Wal-Mart and Asda, in countries, such as Australia, Russia and Denmark. In the future, the young entrepreneur wants to continue expanding his market into more supermarkets from across the world and to continue to diversify the jams’ flavors. Apart from running his business, in 2008, Fraser established a charitable project called ‘SuperJam Tea Parties’ for elderly people living alone, in care homes or sheltered housing. It has hosted hundreds of events with live music, dancing, scones and SuperJam, where up to 600 people can participate. The young Scot has also written two best-selling books, The SuperJam Cookbook and SuperBusiness, containing jam recipes and, respectively, his story and the lessons he has learned in creating his company. Fraser has received numerous accolades for his work. Among other distinctions, in 2007, he was named ‘Global Student Entrepreneur of the Year,’ the first ever winner from outside North America and has been ‘Entrepreneur in Residence’ at the London Metropolitan University since 2010, holding lectures on entrepreneurship.